What’s more fun than something that misbehaves? When it comes to solar dynamics, we know a lot, but there are many things we don’t yet understand. For example, when a particle filled solar flare lashes out from the Sun, its magnetic field lines can do some pretty unexpected things – like split apart and then rapidly reconnect. According to the flux-freezing theorem, these magnetic lines should simply “flow away in lock-step” with the particles. They should stay intact, but they don’t. It’s not just a simple rule they break… it’s a law of physics. What can explain it? In a paper published in the May 23 issue of “Nature”, an interdisciplinary research team led by a Johns Hopkins mathematical physicist may just have found a plausible explanation. According to the group, the underlying factor is turbulence – the “same sort of violent disorder that can jostle a passenger jet when it occurs in the atmosphere” – or the one your brother leaves behind after he’s eaten baked beans. By employing a well-organized and logically constructed computer modeling technique, the researchers were able to simulate what happens when magnetic field lines meet up with turbulence in a solar flare. Armed with this information, they were then able to state their case. Just what is the flux-freezing theorem? Maybe you’ve heard of Hannes Alfvén. He was a Swedish electrical engineer, plasma physicist and winner of the 1970 Nobel Prize in Physics for his work on magnetohydrodynamics (MHD). He’s the man responsible for explaining what we now know as Alfvén waves – a low-frequency travelling oscillation of the ions and the magnetic field in plasma. Well, some 70 years ago, he came up with the thought that magnetic lines of force sail along a locomotive fluid similar to snippets of thread flowing along a stream. It should be impossible for them to break and then join again. However, solar physicists have discovered this just isn’t the case when it comes to activity within a particularly violent solar flare. In their observations, they have determined that the magnetic field lines within these flares can stretch to the breaking point and then reconnect in a surprisingly quick amount of time – as little as 15 minutes. When this happens, it expels a copious amount of energy which, in turn, powers the flare. In conclusion, Eyink noted this type of research work may very well give us a better understanding of solar flares and coronal mass ejections. 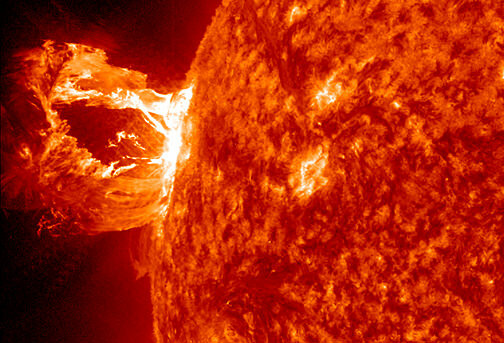 As we know, this type of dangerous “space weather” can be harmful to astronauts, disrupt communications satellites, and even be responsible for the shut-down of electrical power grids on Earth. And you know what that means… no satellite TV and no power to watch it by. But, that’s O.K. Original Story Source: Johns Hopkins University News Release.